Adore me. Call me. Love me. Jump 4 Me. If these were incessant text messages, the demands would read as a little bit creepy. But printed on the artificially pastel-colored Sweethearts candies and exchanged among friends, they’re nostalgic and endearing. I remember being in grade school and passing out Valentines to my peers in brown paper bags, excitedly tearing into a box of these heart-shaped candies, and being mildly disappointed by how chalky they taste. But nevertheless, Sweethearts are the quintessential Valentine’s Day candy, surpassing sales of heart-shaped boxes of chocolates two years in a row. Despite their dominance during the romantic holiday, Sweethearts are taking a break in 2019. It’s not you -- it’s them. After struggling with declining profits the past 15 years and “serious violations” discovered by the FDA (including rodent pellets “too numerous to count” and the discovery of “a dead rodent which measured approximately 12 inches in length”), the New England Confectionery Company -- abbreviated as Necco -- shut down its Massachusetts factory last summer. It’s a sad blow to fans of the candy company, which is considered the first candy company in the United States. Necco has been making sugary treats since 1847 -- including its namesake Necco Wafers, candy buttons, and Mary Janes. The Sweethearts that we all know and love actually date back to 1902. “Back then, besides hearts, [Necco] also produced candy in other various shapes such as postcards, baseballs, horseshoes and watches,” according to Necco’s (now shuttered) website. They also weren’t called Sweethearts just yet; they were modeled after a candy called a “cockle” and later known as “mottoes” in reference to their dye printed texts that delighted kids and adults alike. The nostalgic recipe had also not changed in over a century and consisted of a mixture of sugar, gelatin, corn syrup, gums, coloring, and flavoring. “The enduring popularity of NECCO’s Sweethearts can be attributed to a number of factors: innovation, sentimentality, and smart business decisions,” says Darlene Lacey, a candy historian who’s curated the Candy Wrapper Museum and authored Classic Candy: America’s Favorite Sweets. 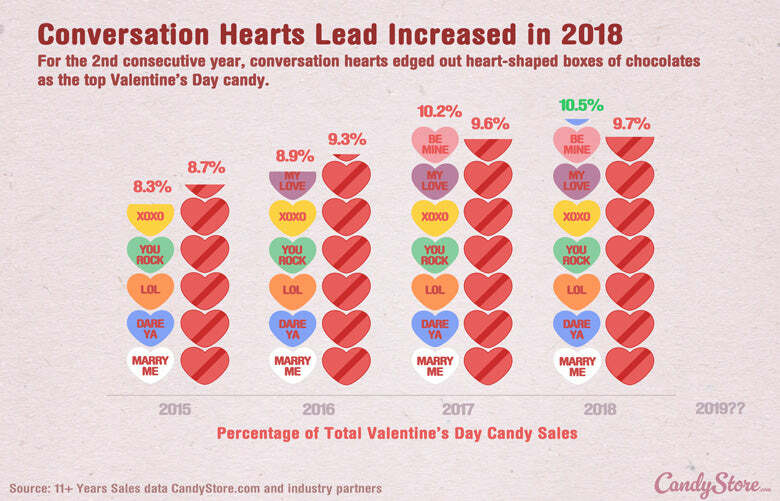 “The idea of candy with personalized messages was not brand new at this time… However, conversation hearts with their numerous sayings were novel in that you could choose just the right message for the one you love." The fact that they didn’t spoil, nor did they really break during transport, also added to their lasting power as one of America’s favorite candies. Boxes of the Necco’s treats were delivered to soldiers during both world wars -- a sweet reminder of Americana for all the homesick soldiers overseas. In addition to the patriotism, Necco’s candy and its factory were a shining beacon within the greater Boston community. At the core of the story of Sweethearts is a sense of nostalgia, tradition, and human connection. “Candy is very sentimental, and people especially cherish the childhood and romantic memories that are inseparable from conversation hearts,” Lacey said. It’s not just a warm feeling -- it’s psychology. “Sweethearts candies may act a memory cue for positive experiences you’ve had when eating those candies in the past. … Recalling specific memories of eating Sweethearts candies may also help you recall other related positive memories associated with Valentine’s Day and the people you care about,” Dr. Brittany Merson, a researcher and adjunct professor, reported. Straying from tradition and the memories fondly associated with the candies may have been the beginning of Necco’s downfall. Even while making upwards of two billion candy hearts each year, the company struggled to keep up. 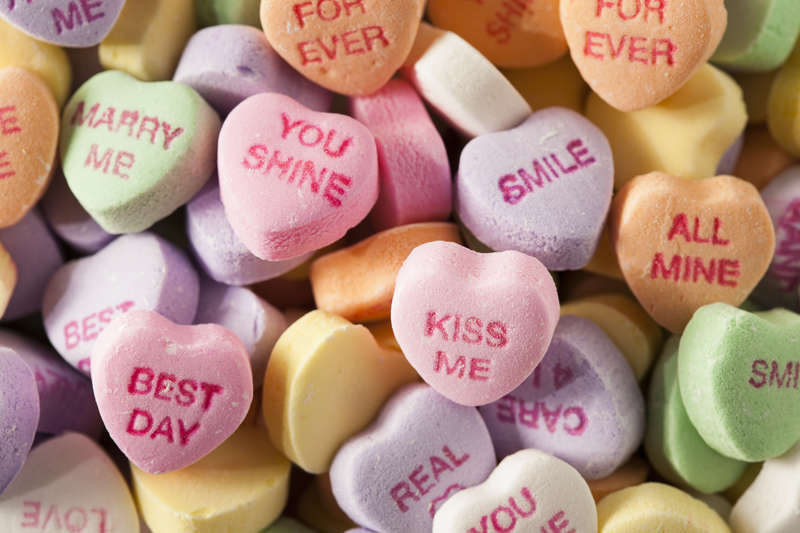 Even while making upwards of 2 billion candy hearts each year, and modernizing the printed texts from “call me” to “fax me” to “email me” to “text me,” the company struggled to keep up. Mass layoffs ensued and buyers quarreled over Necco’s varying brands of candies. 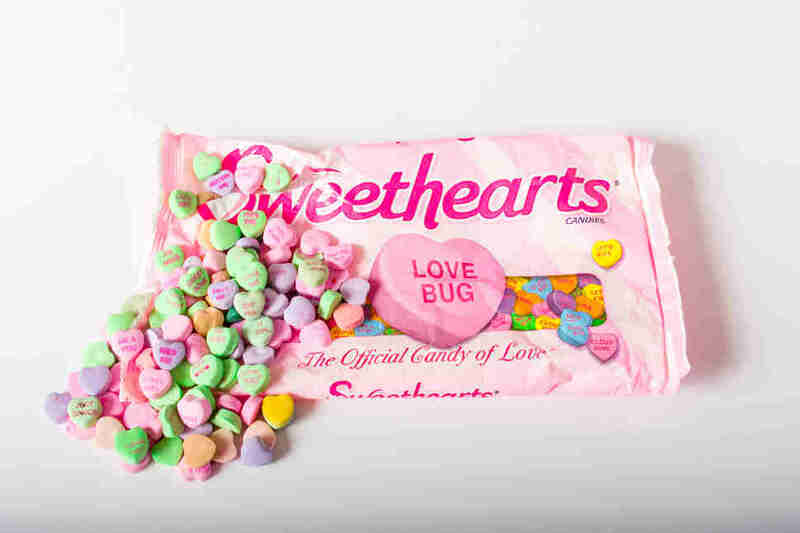 Now, Sweethearts is owned by Spangler Candy Company, the same company that produces Dum-Dums, marshmallow Circus Peanuts, and Spangler Candy canes. Fans wondering about the reemergence of Sweethearts in 2019 were met with a brief, three-heart press release from Spangler, reading, “Miss u 2,” “Wait 4 me,” and “Back Soon.” It’s not the most comforting message, and no date has been set for the return of the powdery hearts just yet. Not all is lost, though. There’s a rival candy hearts brand ready to bask in the spotlight now that Sweethearts are out of commission. Brach’s has been making their own heart-shaped treats to rival Necco’s for decades now. The flavors and colors of Brach’s are even similar to Necco -- wintergreen, banana, orange, lemon, cherry, and grape. If Brach’s isn’t for you, Food52 also has a recipe to create your own chatty conversation hearts. It includes ingredients similar to that of the Necco’s original hearts -- a bunch of sugar and gelatin -- and allows you to come up with your own original messages. But if sugar isn't really your thing -- you can always give your Valentine a love sausage. Kat Thompson is a staff food writer at Thrillist who’d rather get something savoury on Valentine’s Day. You can find some of her food pics on Instagram @katthompsonn.